JFK and Jackie hosted a private dinner for former President Harry Truman. Guests included President Truman’s daughter Bess and her husband Clifton Daniel. 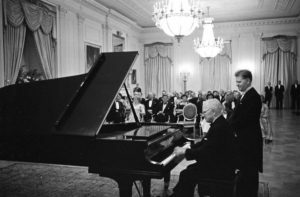 Truman then took to the instrument and played a Paderewski minuet on the same piano that he used when he was President, which had been relocated from the library.